I’m a fan in general of the Urban Decay setting spray range…particularly the All Nighter and De-Slick. Between those and my MAC Fix + Spray (also a long term fav), I never need to pick up an alternative, but always find myself drawn to them and am forever buying and trying new ones from various brands, all with claims of doing all sorts of skin loving things! 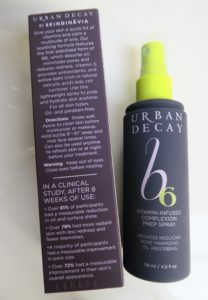 Urban Decay’s B6 Vitamin Infused Complexion Spray was on my beauty radar/ ‘to try’ list for ages, but I think it tends to be a bit over looked, I know that had been the case for me, mainly due to the popularity and social media/ YouTube presence of the brand’s other sprays I think rather than any other reason. Anyway…I was shopping for my usual UD bits, a few months ago now and spotted a travel version of B6 (Available direct from Urban Decay) by the till point. I picked it up and the rest is history. Spoiler alert…I’ve already repurchased the full size (Available direct from Urban Decay) (only just finished my travel size, it lasts forever!) and I actually don’t know how I’ve survived without it in the past! Complexion/ setting sprays in general are one of those products you didn’t even know you needed until you try them and feel/ see the effects. I’m going to share with you why this one, in my opinion is a must if you’re thinking of picking one up, for yourself and/ or your makeup kit! All of Urban Decay’s setting sprays boast a ‘calibrated, microfine’ mist, so basically a very fine mist, a perfectly measured amount and won’t disturb your makeup or feel heavy or sticky on the skin. In my experience of using it though (and from bottle start to finish), I find that the B6 spray, is almost finer still than the others and gives the most even distribution of product of the lot! The B6’s packaging is both user friendly and really sleek looking. It comes in Urban Decay’s signature dark purple, with a soft touch feel to the bottle and a bright lime green sprayer. Like all other UD sprays, a smaller inner cap as well as a larger sprayer cover mean it’s really secure and perfect for travel and for in your bag when you’re on the move! 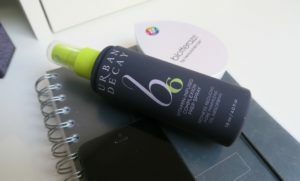 The Urban Decay B6 gives skin a hit of vitamins as well as calming a multitude of skin issues! It contains a stabilised form of topical vitamin B6 (as far as I’m aware, it was the first product on the market that did…let me know in the comments if you can think of anything else containing it, I’d be interested to know/ try!) which absorbs oil, minimizes pores, reduces redness and with the B6 spray also providing radiance giving nourishment and hydration to the skin, it’s an all round winner in my book! It also contains vitamin E which is an antioxidant and an ingredient called Willow Bark, which is rich in natural Salicylic Acid. It aids cell turn over and as well as being beneficial to all, it’s amazing if you have acne prone skin! It actually delivers for me on so many levels and very much lives up to it’s claims! I use it after moisturiser and before or actually instead of primer before my makeup, during makeup application to allow makeup to adhere without looking cakey and at the end as a finishing spray. I also mist it over my face anytime for a refresh AND often on bare skin before bed, it works as a kind of treatment too, improving redness, clarity and pore size with continued use…there really is nothing it can’t do for your skin! It’s suitable for all skin types and is oil, paraben and (as always with Urban Decay) cruelty free. It comes in a 118ml full size and 30ml travel size. FYI…I’m keeping my travel size bottle to refill from my full size, I need it with me at all times, ha ha! Makes sense from a price point of view too, it costs £10/ 15 euro for the 30ml and comparably only £23/ 30euro for the 118ml full size! PRO TIP – Spritz your damp beauty blender or foundation brush (works amazingly on your concealer brush too!) with the B6 Spray to give a beautifully radiant, yet super long lasting finish to your base! If you try it, let me know…hope you love it as much as I do!